Hakusan, Japan, November 18, 2014 – EIZO Corporation (TSE: 6737) today announced the new FlexScan EV2730Q, a 26.5-inch square monitor with a 1920 × 1920 resolution (1:1 aspect ratio). The monitor is the newest addition to EIZO’s FlexScan EcoView Series which combines both ergonomic and environmental features for an economical result. 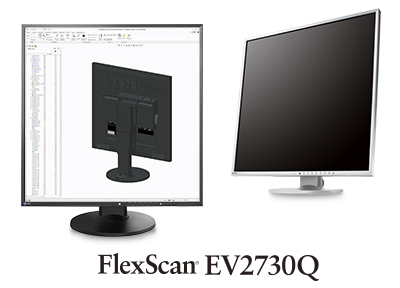 The FlexScan EV2730Q is wide all around – the unique 1920 × 1920 resolution provides users with 78% more pixels compared with a standard widescreen 1920 × 1080 monitor. The extended vertical space is convenient for displaying large amounts of information in long windows, reducing the need for excess scrolling and providing a more efficient view of data. This makes the monitor ideal for displaying information such as CAD or program development data with a more complete overall view on screen. The non-glare IPS panel has wide viewing angles, making the monitor comfortable to view in any workstation and from any angle. The ergonomically designed stand with height adjustment, tilt, and swivel provides positioning flexibility and user comfort. To lower eyestrain, the monitor utilizes an EIZO-developed solution that regulates brightness to make flicker unperceivable. In addition, the wide dimming range allows the monitor to be adjusted to just 1% of maximum brightness for higher comfort in dimly-lit work environments. Five preset modes are included – sRGB, Movie, Paper, and two modes with user-adjustable settings. Paper mode reduces the amount of blue light to help prevent eye fatigue. The monitor includes EIZO’s own EcoView technologies such as EcoView Optimizer 2, which saves power by reducing the backlight brightness and increasing the gain when displaying mostly dark content. In addition, Auto EcoView automatically adjusts the screen’s brightness in accordance with changes in ambient lighting to trim power usage while reducing eye fatigue. A presence sensor called EcoView Sense 2 detects when the user leaves the desk and automatically switches to power save mode. When the user returns, EcoView Sense 2 powers the monitor on again. It detects both the user’s movements and body heat for increased accuracy. The FlexScan EV2730Q will be available from the first quarter of 2015. Date of availability varies by country so contact the EIZO group company or distributor in your country for details.